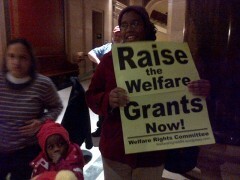 MN Governor Dayton gets earful at State of the State address, told to raise welfare grants | Fight Back! St Paul, MN – Minnesota’s Governor Mark Dayton got an earful from members of the Welfare Rights Committee, Feb. 6, when he entered the House chambers in the Capitol building to deliver his State of the State address. Members of the Welfare Rights Committee (WRC) told Dayton that this is the year to raise the grants for people on public assistance. Dayton did not include a grant increase in his budget proposal. The grants have not gone up since 1986. The WRC legislation to double the welfare grants will be introduced this week.